Most people only dream of playing sports at a professional level, and most college athletes don’t get to make the jump from collegiate to professional level. Jordan Gray, a BYU women’s rugby alumna, beat those odds when she became part of the USA National Rugby team in 2016. Gray has played rugby for 12 years, beginning her career in her freshman year at Centennial High School in Alberta, Canada. After she graduated from high school, Gray found she could continue the sport she loved with BYU’s women’s rugby team. Gray received All-American honors each year from 2011 to 2016 and led the top-ranked BYU team to their highest ranking in the DI Elite Championship in 2016. That same year, she also was recognized as the Rugby Breakdown’s College Player of the Year. “(Gray) had scholarship offers from other schools, but chose BYU to get the best education,” said BYU rugby head coach Tom Waqa, who coached Gray through her years on the BYU women’s team. Since graduating from BYU in 2016, Gray has participated in both the 2017 World Cup in Ireland and the 2018 World Cup in San Francisco. The USA women’s national team reached the semi-finals in the 2017 World Cup, where they fell to New Zealand, receiving fourth place. They also reached the semi-finals in the 2018 World Cup in San Francisco. When asked about his former students’ success, Waqa was quick to praise his former captain. Gray hopes to use this international platform to promote her values and beliefs as a member of The Church of Jesus Christ of Latter-day Saints. 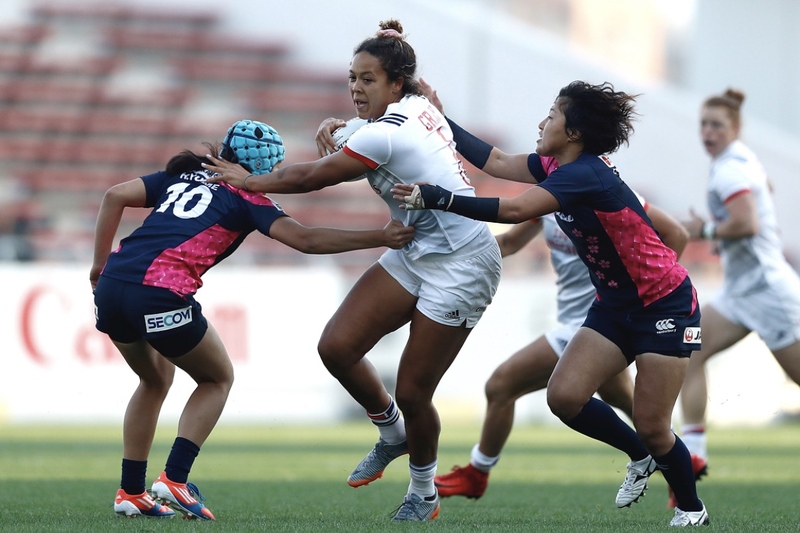 As her professional career continues, Gray said she hopes to progress further in the world of rugby and help make a name for the sport in the U.S.
Gray said she plans to work hard and prepare with the team to best represent the U.S. and their rugby league in the world cup next year. Although she has been on the team for the last two years, Gray said she still can’t believe she gets to make a career out of something she loves so much. When asked what advice she has for the current members of BYU’s rugby team, Gray emphasized the need to work hard but have fun. Jordan Gray and the U.S. team play in the November Test series in Europe with matches against Ireland and New Zealand. For more info on the USA Women’s Eagles, visit usarugby.org.